Yeahh..it arrived today. Did I take a photo of it? Ah, no. Silly me. Just know I'm excited! Hahaha. Really lightweight and has fixtures to release and tighten the legs that are like light switches. It's great. I'll take pics tomorrow. I'll have to figure how to weight it if it's windy out but the legs extend far out so it should be quite stable. So, I finished one commission. Now on to the next three. Earlier I went down to work at the rec hall but it was really chilly inside. The heat doesn't work as yet so I decided to pack things up and come back to CiCi Blue to work. I.m hoping my client is pleased but I'm sure they will be. The colors are a somewhat bright on here so in your mind tone it down a bit. Photo shop and I are always testing each other. 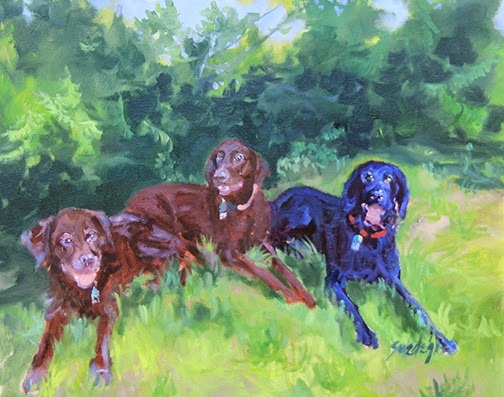 I do tend to use blues in my black Labs but not fluorescent blues. That is what seems to be showing on my screen. sigh. I also started an art group on RVillage an online group for RV ers. Since we are always on the road or at an RV Park or dry camping it would be nice to have a place to show what we create and where we can purchase it. I'm excited and even have people joining the group!! Fine Art America, a wonderful on line site where you place your art, painting, photography, has just started making throw pillows with our images on them. I'm so ready to decorate Ci Ci Blue with our work! And some others. Time to feed the babies. Lola is making a fuss. Woofing and knocking her head into us for attention. We just came back in from the park so it's not that,...she's hungry! Poor starving girl! Have a great night!! Stay warm.